Lovely in lace, this short taupe party dress elicits an air of feminine style. This lace party dress features a fitted princess-cut bodice with a lace-trimmed high neckline. Matching lace trim highlights the sleeveless shoulders giving this short dress a dainty detail. A small seam encircles the midline and gives way to a short skirt that flares softly. 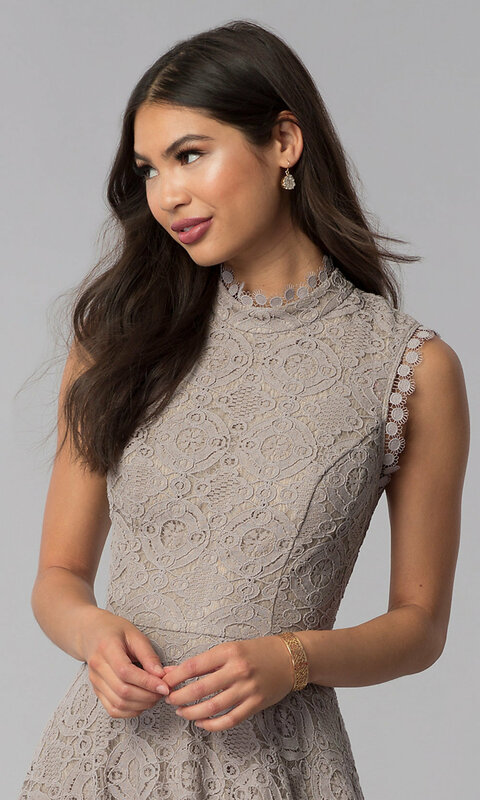 This fully-lined taupe lace fit-and-flare party dress by the designers at City Triangles is offered in junior sizes for wedding guests, graduates, and party-goers alike.